Confused by the varying religious views in your workplace, neighborhood, even your family? 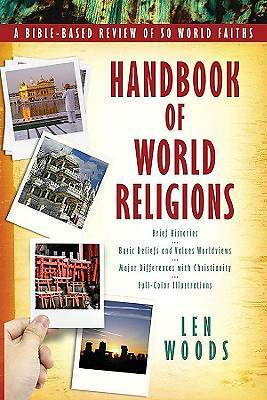 Check out the Handbook of World Religions, contrasting 50 faiths with Christianity. Christians believe Jesus' claim to be "the way and the truth and the life" (John 14:6), though dozens of other religions propose varying pathways to God, heaven, or ultimate personal fulfillment. Describing these alternate viewpoints fairly and non-judgmentally, the Handbook of World Religions features major world faiths (Judaism, Islam, Buddhism, and Hinduism), Christian-based religions (Mormonism, the Unification Church, Christian Science), traditional religions (African, Chinese, Native American), and various hard-to-categorize beliefs (Gnosticism, Hare Krishna, New Age Spirituality, Rastafarianism, Wicca). This fully-illustrated guide is a fascinating and useful tool to help Christians understand others' beliefs.